YOUNG AND FOR THE EARTH : A crowd of a few hundred mostly young people gathered at the Statehouse on Tuesday to push for more action on climate change. Some of them traveled up to 65 miles to draw attention to their cause. MONTPELIER — Hundreds of climate activists marched the streets of Montpelier on Tuesday, braving sleet and rain just to urge lawmakers to take action against global warming. In all, they had traveled over 65 miles, starting in Middlebury. 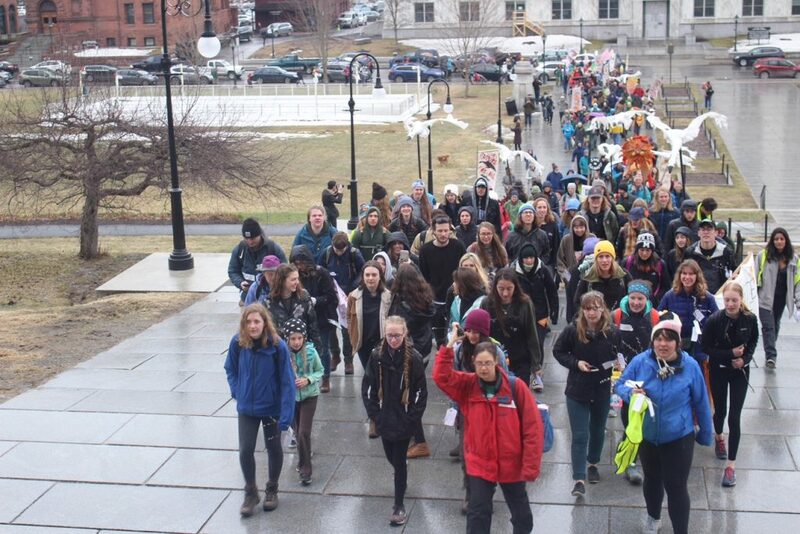 The primary organizer was 350Vermont, joined by Sunrise Middlebury, Sunrise Burlington, Vermont Youth Lobby, Root Social Justice Center Youth 4 Change, and EnACT. “During the journey of over 60 miles, walkers highlighted the climate consequences of the build-out of the Vermont Gas pipeline, while also celebrating and promoting examples of climate solutions,” said a statement from 350Vermont. They arrived on the Statehouse steps singing songs and chants, and flooded the hallways with fists raised. They took turns reading out their core beliefs in the main lobby. “Please protect our soils and remember that we are on stolen ground,” one person said. “Please preserve winter in Vermont,” said another protester. H.175 aims to “prohibit the exercise of eminent domain by utilities for purposes of fossil fuel infrastructure.” It also is in the House energy committee. Zac Rudge, spokesperson for 350Vermont, told True North that the 65-mile journey was helped by supporters from local communities who provided temporary lodging. He noted Bristol and Hinesburg, which have been engaged in political resistance to a natural gas pipeline. Julie Macuga, 350Vermont’s extreme energy organizer, issued a statement calling for a ban on all carbon-based energy infrastructure. This would include pipelines. Ripton resident Bill McKibben, a co-founder of 350.org, also made comments blasting lawmakers for not doing more. Leif Taranta, of Middlebury, did the entire walk from start to finish and took on a role as spokesperson for the march. He was asked by True North about the higher costs for green energy alternatives. Wind and solar power continue to get 30 percent federal tax credits and they often need state mandates to nudge power utilities to take on the higher costs. Taranta said it’s better to pay more than face climate change. “On a wider scale of it being expensive, I find that it’s a tricky argument because climate change is going to be expensive and the damage of climate change is going to be expensive, both infrastructure-wise and also just human health-wise and in terms of the agricultural costs that will come from a warming climate,” he said. Another big renewable push discussed by marchers was home weatherization. Heather Stevenson of 350Vermont told True North about that initiative. “It’s gonna bring in jobs. It’s gonna save money, because, of every dollar we spend on fossil fuels, 70 cents goes out of state,” she said. “I think we should be spending money on Vermonters. Were all those homes, churhes etc sheltering these selfless marchers…..
Have heat and hot water? Lights in the night – no solar power. Candles make smoke. Would the ambulance they might need run on fairy dust? Hospital cold and without power. Food they eat NOT fertilized; grown and picked entirely by stoop labor. These questions don’t even touch the anti – everything culture. Insanity is taking over 1/4th of Vermont polulation and 80% of our elected legislature. If only we could do a background check of these protesters to find out where they are really from. Just think how wonderful these self absorbed snowflakes feel about themselves. They just love to feel smart and morally superior. These people harm working Vermonters and the elderly, while having zero (0) measurable effect on climate change. Most real Vermonters were working Tuesday. I hope none of them farted on the way there and added to the pollution. Why are these climate activists not at work? Are they on a government payroll? Are they students not attending class? Are they on welfare, and getting a government check? Just about every Vermonter goes to work every day. If they take time off to do marching and protesting they likely don’t get paid? Got a better idea. How about marching 10,000 miles to the real villain in global warming? CHINA!!!!!!!!!!!! Vermont is at best .0000001% responsible. nuke power and got Vernon closed. The lemmings also complain we are on stolen ground??? Why am I paying taxes on it then? Did they not notice the unusually cold April they are taking their walkie on. Seems like we have an ongoing astro turf problem in this state. We need organic, Vermont groups, just say no to astro turf organizers. xackly, As John said paid puppets of the leftist Agenda. 360 = Local version of the Gorebullcrap Al the global warming cape crusader. Yep their all astro turffers of the insane asylum of climatetardism..
OK, again, The only constant is change. Everything that happens in nature is cyclical. I’m sure they did not notice how long and cold this winter has been. I go with paid puppets. the world explodes…….according to AOC. and New York… I’d start there !! Vermont’s not a dot on the map. VT is full of circus people. I believe thy are marching to Montpelier to get their welfare checks. Mindless Snowflakes all! These are the Flat Earth people. You don’t see “The Greatest Generation” in this group who are mostly working to “Struggle and Live in Vermont”. This is really quit funny, the Montpelier joke of the week. Did they get Scott to change his mind? like he changed his mind about gun control. Wonder who the next group will be.